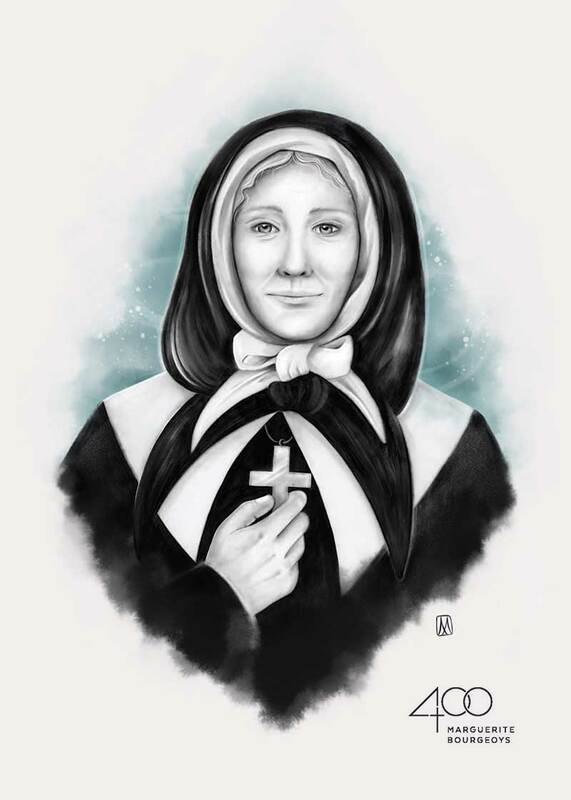 Les Sœurs de la Congrégation de Notre-Dame will celebrate a very special anniversary in 2020: the 400th anniversary of the birth of Marguerite Bourgeoys, Montreal’s first teacher and foundress of the Congregation. Throughout 2020, activities organized by our museums will highlight this 400th anniversary and a mini website will feature a calendar of events and information: www.margueritebourgeoys400.org. We also invite you to visit the Musée Marguerite-Bourgeoys and Maison Saint-Gabriel websites to learn more. Born in Troyes, France, on April 17, 1620, Marguerite Bourgeoys embarked for the New World at the age of 33 at the request of Paul de Chomedey de Maisonneuve. Having journeyed there to be a teacher, her first activities were to provide as many services as she could in order to fulfill the needs that arose. She welcomed and lodged the Filles du Roy. With the settlers’ help, she had the cross on Mount Royal re-erected and built the first stone chapel (Notre-Dame-de-Bon-Secours.) Finally, in 1658, she opened Montreal's first free school, which received girls and boys. In 1659, she returned to France to recruit companions who would form, with her, the core of the Congrégation de Notre-Dame. Very soon, the sisters travelled on mission in Canada, the United States and Japan to teach in the numerous schools they had either established and/or directed. From the 1960s, they journeyed to other missions in Central America, Cameroon and France. Still actively present among families and parishes, they advocate for greater social justice and the respect of all Creation. It is with great joy that, throughout 2020, the Sisters of the Congregation will celebrate this 400th anniversary. Four hundred years ago began the great adventure of an intrepid and compassionate woman, who put herself in the service of the people to build a new society.